When asked “Why did you become a doctor?” Dr. Bahram Meymand replies “Because I love helping people, I love healing people.”He goes on to mention that even from the time he was a child, he wanted to be a doctor. Maybe some of it is ‘in the genes’- his grandmother was preparing fresh vegetable juice for her children back in the 1950’s, when such a thing was virtually unheard of.Then, when Bahram was an adolescent, his mother started on her path to becoming a doctor.By the time she had completed her internship and was ready to open up her own practice, Bahram was 15, and without question, became her ‘right hand man’.When it was time to select a career and a college, there was no doubt what he was going to do- he was to be a doctor. 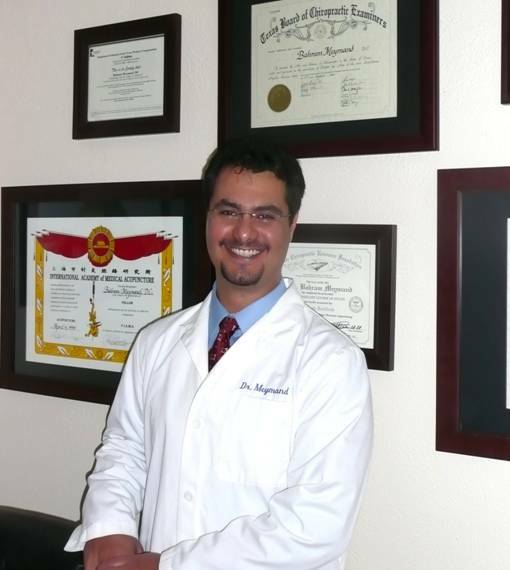 He completed his doctoral education at Parker College of Chiropractic, and is licensed by the Texas Board of Chiropractic Examiners.As a doctor who respects and supports holistic, complementary medical therapies, he pursued training in the ancient art of acupuncture, and now holds the distinction as a Fellow of the International Academy of Medical Acupuncture (F.I.A.M.A. ).In addition, he is recognized as an Approved Doctor by the Texas Workers' Compensation Commission. He is the founder and owner of Discovery Back and Body Center, where he loves what he does and he does what he loves.Dr. Meymand’s patients represent a diverse variety of vocations, including accountants, corporate executives, dentists, massage therapists, medical doctors, professional golfers, athletes, hair designers, personal trainers, professors, secretaries, professional speakers, and performing artists. His passion is in helping them live their lives to the upmost potential. Of course, many folks come in because they want to eliminate their musculoskeletal pain, and know that chiropractic is the #1 choice for natural, non-invasive health care. Once their pain has been addressed, he then educates his patients on lifestyle choices that can vary from an ergonomic work environment to an appropriate exercise program. In this manner, he can treat the whole person and help them to truly improve their lives!